Here’s a review I did recently for Upside Down World. Zibechi’s book is fantastic, I definitely recommend it. In his first book translated to English, veteran Uruguayan journalist and scholar Raúl Zibechi draws on the Aymara city of El Alto in Bolivia as source of inspiration and possibility, a unique example among the many important popular and Indigenous struggles unfolding throughout Latin America. But Zibechi is far from a cynic. Instead, he offers an in-depth exploration and analysis of the many possibilities of movement building that exist outside of leftist organizing oriented towards taking state power. “The experience of the social movement in the city of El Alto should be observed carefully, because it suggests that large numbers of humans can live without the state: something that has not been apparent until now and which has been a stumbling block from the standpoint of social emancipation,” writes Zibechi. Indeed, rather than dwell on critiques of the MAS or of Morales, Zibechi spends the bulk of Dispersing Power examining how the Aymara movement in El Alto has organized over the past decades, and especially since the first major Aymara uprising against neo-liberalism in 2000. He says the uprisings in Bolivia since 2000 represent the most important “revolution within a revolution” since the Zapatista uprising began in 1994. “The Aymara experience is not only linked with the continental struggles but it also adds something substantial – the construction of actual non state powers,” writes Zibechi. But the dispersion of power has another important element, according to Zibechi, which is the avoidance of creating hierarchical leadership structures. This is done in part through the continuous rotation of tasks, and through a requirement of reaching consensus in assemblies. “The institutionalization of social movements is one way of establishing state powers, in which the leaders – or the bodies of leaders – are separated from the movement as a whole,” writes Zibechi, indicating that a key success of the Aymara movement is the active avoidance of institutionalization and the separation of leadership from the movement. Though Zibechi has written and published analysis and articles from almost every country in the continent, he doesn’t overwhelm readers by trying to draw parallels or contrasting the Aymara movement in El Alto with other organizing in the hemisphere, with two exceptions: Indigenous organizing in Ecuador and the Zapatista movement in Chiapas. 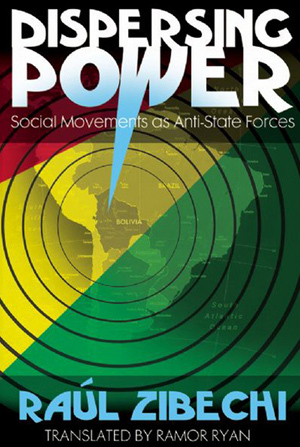 Of particular interest for first world activists and scholars, Dispersing Power describes how the presence of hundreds of development NGOs in Indigenous territories in Ecuador have generated significant stumbling blocks for Indigenous resistance. “For global elites who want to destroy the Indian movements, the strategy of development, and that of power or participation in the state (that are two sides of the same coin) can be interpreted as a sort of ‘low intensity warfare’ against Indians,” he writes. The role and aim of these development projects is particularly articulated in Ecuador, and Zibechi argues that it would be a shame if other movements, including the Aymara movement in Bolivia, fail to learn from this example. Readers who want to get their feet wet with Zibechi can read his regular updates, translated to English for the CIP Americas Program http://www.cipamericas.org/archives/author/zibechi. Anyone who is serious about understanding power, organizing and social movements in Bolivia particularly, but with an eye to the hemispheric context of anti-capitalist struggles, would be well served to pick up his newest book.